The Pikler Arch - at Nine Months. How and Why. At nine months Otto is pulling up on his Pikler Arch. He sometimes steps up to the first rail and today I noticed he put one foot up to the second rail. It takes time, he is experimenting, he is testing and challenging himself! The Pikler Arch provides a fantastic opportunity to meet his developmental needs in a safe and supervised way. Always supervise. I wouldn't put this in the child's bedroom. We have it in his movement/play area, next to our living area which is always supervised. Have it on or near a soft or padded surface. I wouldn't put the arch directly on hard tiles. Ours is on a wool rug which works fine. I considered putting a lambswool or thin mattress nearby but so far it's not needed. Allow the child to explore it independently. They will use it when they are ready. There is no need to incentivize or show them how to do it and I would never put a child on it. Just make it available! It's small. It's perfect for the child who is at the very beginning of their climbing, they can use it to pull to standing and there is no risk of them getting stuck or climbing too high that they can't get down. The dimensions and the distance between the rails has been designed for infants from crawling. Fantastic for their muscle development and coordination. Otto is a great climber and he needs to climb. He climbs our stairs, couches, equipment at the playground and the arch is another avenue for him to explore. Assists the child to meet developmental needs. Climbing, exploring, testing limits and capabilities are real developmental needs. When the child's developmental needs are met they are generally more settled, calm and happy. Assist the child to develop spatial awareness. Because of the design, it empowers babies. T,he steps are small, they can use the rails to pull up with their hands, it enables the infant and allows them to safely use their growing bodies in new and exciting ways. It brings joy. The Pikler Arch brings joy to the child when they realize what they are capable of when they fulfill their aim. I can see Otto beam with pride when he climbs up on it. Assists children to develop to their full potential. I like the idea of having the Pikler Arch in the environment before the child is ready to use it, so they can use it from the start to pull up on and grow up using it, testing themselves and their physical capabilities. I love this article at Midwest Montessori about Simon using the Pikler Triangle at seven months! Our Pikler Arch is c/o Wiwiurka. This exact arch was on my wishlist way before my pregnancy with Otto. It is absolutely gorgeous and I highly recommend it. When Otto started crawling we used it as a tunnel as it's wonderful for imaginative play, just put a few large play silks over the top. It is 90 cm long, 46cm high and 54 cm wide and the sides are made of unfinished European Birch. It does not take up a lot of space and it looks fantastic in the child's play area. The suggested age range for this arch is from crawling to 30 months - it would be perfect for a first birthday or as a gift. I've been thinking about gift ideas for Montessori children around five to six years old. Most of my ideas end up being STEM related. This list is naturally influenced by my own children, what they have loved over the last few years and the toys they still hope to receive. Children of this age are often inquisitive, wanting to learn more about the world (and universe) and finding out how things work, often they like to make and create with their hands. For many Montessori families, this is an appropriate age to introduce technology and many children love early coding toys (mine do!). Here are a few of my favorite gift ideas for children five to six years. Children's Telescope - So they can see the moon and its craters! Dash Robot - My kids have used these in workshops and have loved them. Digital Camera - Make it shock and water-proof. I love the idea of the child being able to independently document field trips, camps, trips to the beach and holidays. Marble Run - The bigger the better. Easy Weaver Kids Weaving Loom - This looks fabulous. Digital Microscope or First Microscope - We have and can recommend both of these! Makey Makey - Age recommendation is eight years and up but one to think about if you are willing to play with the child or if they have an older sibling who can help. Both of my children have also enjoyed using the Little Bits kits. Chess - If your child doesn't know how to play, perhaps now it the time to teach them? Kite - Remember those? If your child is adventurous perhaps find a stunt kite? Children's Hammock - We bought the boys an outdoor hammock last year and it's the best thing, they love it. Pulley Set (with Wooden Reels and Nylon Ropes) - Similar here in Australia. For some outdoor fun with a little science and engineering. Children's Card Game Set - Some good old-fashioned fun. Crayon Rocks - Australia here. K'Nex or Lego Technic - These are recommended for children seven years but my six-year-old loves them! Consider the child's building experience and if they have someone to help (such as an older sibling) if needed. Playline Slackline - Slacklining for beginners. Face and Body Crayons - Just because these are a favorite of my six year old! Cubetto Coding Toy - A coding toy recommended for children from three years and up. Online Art Classes - Perfect for an art-loving child. The older the child the easier it is to select gifts based on their interests. This list could be much larger because children of this age are often interested in so many things. I'd love to hear what is on your wish list this year! Montessori Gift Ideas. Wonderful Wooden Blocks! I remember reading, perhaps in The Absorbent Mind, that Maria Montessori suggested children only need two toys at home, a basket of wooden blocks and a special bear or doll. Over the years I've seen the value and witnessed the benefits of having blocks in the home. We've been fortunate to have a few different block sets so I thought I would share some of our favorites with you. These make lovely, wholesome, practical gifts that will last for years! If you are able to find a good quality set I also recommend Unit Blocks, they are larger than most block sets and lead to big block play, children often build structures taller than themselves. Ours are similar to these (from MTA), but also similar to this Melissa and Doug Set or these from Carolina Pratt. Teaching Numeracy, Language, and Literacy with Blocks is a good book to have if you are looking to make most of the educational opportunities of block play including the use of unit blocks. If you have little ones I recommend to start with a small block set from Grimm's. We have the Rainbow GeoBlocks, which were Otis' first blocks and will be passed onto Otto. It's hard to go past interlocking blocks, children can use them to create and build in new and exciting ways. I also love tree blocks and those with bark for added texture! We've also had a lot of success with magnetic blocks. Building with blocks is foundational, a critical skill, but it can also be a lot of fun where children can get immersed for hours! Here are some of the most gorgeous and Montessori family friendly Christmas puzzles! It's all about stacking, sorting, sequencing, patterns, and finding order! All of these puzzles would work beautifully in a tray or on a child's work shelves. I really love the natural timber puzzles. Don't forget about nesting dolls, they make wonderful decorations and children love to stack, sort and put them away. The age ranges are a guide only. 1. Wooden Christmas Tree Puzzle. The beauty of this puzzle is in it's simplicity. 2. Chunky Wooden Christmas Puzzle. 3. Christmas Blocks. A puzzle that doubles as decoration! 4. Nativity Nesting Dolls. Perfect for the child's sense of order. Once the child has mastered the nesting dolls, see if they can put them away with their eyes closed or blindfolded. 5. Natural Angel, Wood Deer, and Pine Tree Puzzles. I adore these very simple two, three and four piece puzzles. 6. Magnetic Dress Up Santa. 7. Santa's Sleigh Wooden Chunky Puzzle (9 pieces). A very sweet puzzle featuring Santa and his Reindeers. 8. Christmas Tree Triangle Puzzle. 9. Gingerbread Houses Family Puzzle. This puzzle is designed to be used by a group of people with different skill levels as it has three different sized pieces. I love at Christmas to have a puzzle going on the table for everyone to contribute to and this puzzle would be perfect! It has 400 pieces. I've ordered Otis two Christmas puzzles by Ravensburger, which is one of my favourite puzzle brands, their age suggestions are usually spot on! When looking for Christmas gift ideas it's easy to think all the good toys come from overseas. 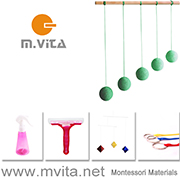 These gift ideas do not include Montessori materials but they are suitable for the Montessori child and they are all made by Australian companies. I have tried to include as many small businesses and handmade goods as possible while also highlighting some of our favourite Australian products! Many of these stores ship overseas too. 1. Little backpacks perfect for independent Montessori children by Bagbini (international shipping available). 2. Playdough and accessories at Happy Hands Happy Heart (we love this playdough, the texture and fragrances are unique). 3. Gentle skin care from Sukin. 4. Natural toothpaste (we've used this brand for years) and compostable toothbrushes from Jack N' Jill (also available in the US here). 5. Reindeer Costume at StitchandWillow (Etsy) (my five year old would love this!!). 6. Healthy Flash Cards (good for all types of learning) at Teepee Learning (international shipping available). I also love these Pregnancy and Birth Affirmation Cards. 7. 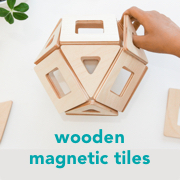 There are not many Montessori material manufacturers in Australia but Wood Puzzles has a good range of language materials and Australian made wooden trays. I recommend the Magnetic Movable Alphabet and the pictured Alphabet Boards. 8. & 9. Child size, real, Tool Set and Gardening Set with Gloves at Me2Me2. 10. & 11. The Happy Architect and Alphabet Matching Pairs at The Freckled Frog. 12. Baby Morris board books at Little Kids Things. 13. Wooden Crayon Holder at Folkwood (Etsy). 14. DIY Coloured Beeswax Kit by Luxmi (this is the small kit for making birthday candles, would be lovely for a younger child, the larger coloured kit is listed here). 15. Star Garland at KirraKai (Etsy), perfect child and environmentally friendly decorations. And how cute is this soft Humpback Whale and these felt fruits and vegetables? I hope you enjoyed this little snippet of what Australian stores have to offer! Labyrinth and Maze Toys for Kids! I have started looking around for Christmas gifts for my chlildren. I came across this awesome junior labyrinth (for Otis 5yrs) and it got me thinking about other, similar toys. I am sure these are great for building concentration, developing hand-eye coordination, and visual perception. They would also be fun to use with family or friends. Many of these would be well suited to a Montessori environment, gross motor area or toddler area! I love this quote from MontessoriReStore. "The labyrinth is an ancient symbol that relates to wholeness. It combines the imagery of the circle and the spiral into a meandering but purposeful path. It represents a journey to our own center and back out again into the world . The simplicity engages the right side of the brain allowing intuition, creativity and imagery to form a meditative exercise to reconnect you with your center. It has been found to enhance wellness, express emotions and create a sense of well-being for centuries. Use a personal labyrinth to center a child between tasks or just when the child needs a moment of reflection." 9. Marble Maze Children's Balance Board - Guidecraft.